COMPANY PROFILE PPL Corp is an energy and utility holding company operating through its subsidiaries. The company generates and markets electricity in the northeastern and western U.S. and in the delivery of electricity in Pennsylvania and the U.K.
PPL is a regulated utility with three key segments. The international regulated delivery segment operates distribution networks providing electricity service to customers in the United Kingdom. The Pennsylvania regulated delivery and transmission segment provides distribution to customers in central and eastern Pennsylvania. LG&E and KU are involved in regulated electricity generation, transmission, and distribution in Kentucky. 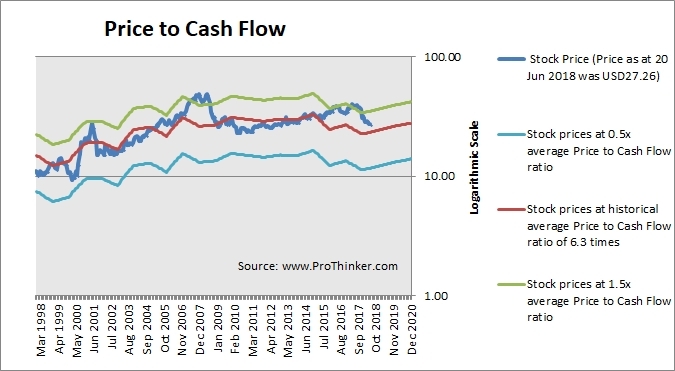 At the price of USD27.26 as at 20 Jun 2018, Ppl Corp is trading at a Price to Cash Flow Ratio of 7.4 times last 12 months cash flow. 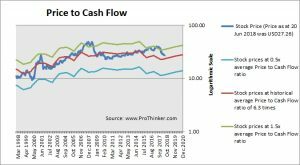 This is a 17.0% premium to its historical average Price to Cash Flow Ratio of 6.3 times.